On route from Kuala Lumpur we flew with Air Asia into Haneda Airport, touching down in Tokyo city just before midnight. 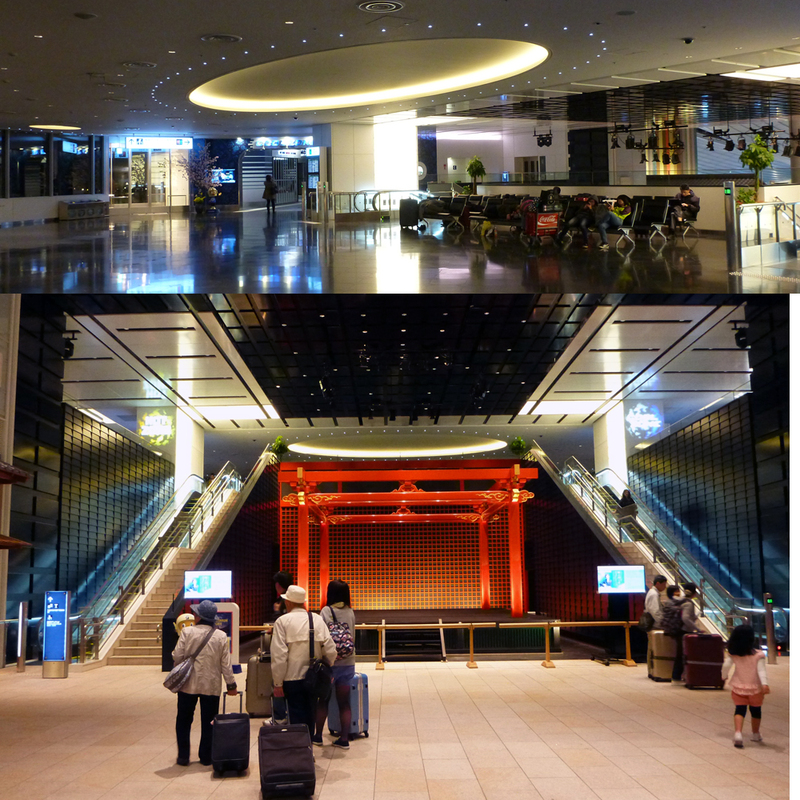 The rather unusual thing about Haneda airport is the train services stop just after midnight, leaving airport arrivals the choice of an expensive taxi or a limited stop night bus. Following an interesting conversation with my former boss a few months prior, we decided to hang around in the airport until the train services started up again after 5.00am. 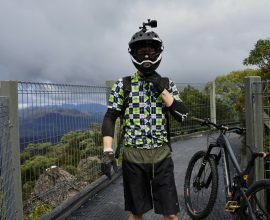 Long distance is something I consider to be part and parcel of travelling from Western Australia. Multiple flights and lengthy airport transits, we have encountered them all. The time it would take to clear customs, find our way to transport with a basic Japanese language knowledge, reach the city and check into the hotel for a few hours before checking out to travel all over again, our sleep would be compromised either way. Dollar wise, we would save roughly $300.00 (when one travels during Cherry Blossom season) by hanging around in the airport but more importantly, how would our own sanity be? Would it be like Howie’s predicament from The Big Bang Theory considering a moon trip for the 2nd time? Had we forgotten the drawn out tensions of being in an airport for hours on end? My line of thinking was that having done 48 hours of no sleep from a Perth to Geneva trip, 24 hours surely would be a breeze! It was just after midnight when we cleared the efficiently run customs area and my goodness were we ready to eat! Most of the establishments were finishing up for the evening but tucked away in the Edomae Yokocho section of the Edo Ko-Ji 4F level we found a restaurant called Suginoko, a smoking friendly establishment. During our time in Japan we came across a number of oddities as they were, that did not exactly fit in with our thought up image of Japan. This was the first oddity, smoking. In Tokyo it seems to be widely accepted, of all places you can dine in an airport restaurant with a cigarette in one hand and chopsticks in the other, well if you can use chopsticks with one hand! So there, Derek and I were standing side by side in front of this restaurant window observing the cloud of smoke lingering below the ceiling and above the patron’s heads. I dislike smoking, however at this point across the Pacific, I was famished and nothing else mattered. Leaving our luggage by the door, we took up our seats in the very back corner with a special English menu to browse through. In a foreign country if you do not observe your surroundings you will be hopelessly lost becoming that all too common ignorant tourist. We noticed in those first few minutes that the waiter would only approach the tables when a) called and b) to deliver the orders, this was similar in most restaurants we visited. We did like everyone else, waved our hand ever so politely to place our orders. I ordered the Saikyo miso grilled salmon set (1580 yen) and Derek the sashimi platter (1990 yen). We shared a plate of chicken meat balls (320 yen). Our first meal in Japan, we toasted over sweet peach flavoured alcohol. I forgot about the smoke, our English conversation blending in with the rest of the crowd. 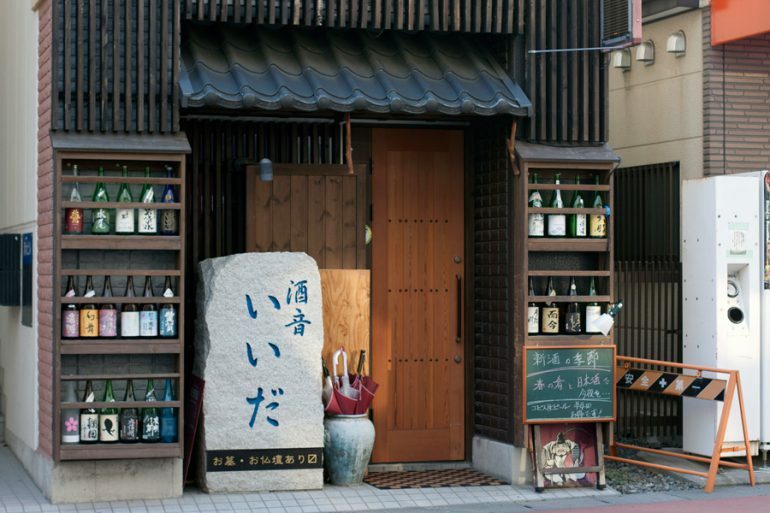 It was a great atmosphere for what felt like a Izakaya in downtown Tokyo and not an airport restaurant! A little tipsy we left with nowhere to go and nowhere to be, we changed some currency over, charged the mobile phones and checked in with our family over email. A week after the disappearance of MH370, both of our families were nervous of our travels and we had to make sure we did not forget to drop a quick message. My mother has a wandering imagination that can dream up the worst of disasters! The mood of an airport changes after midnight, the flurry of people and sounds of rolling suitcases disappear along with the jet roaring planes. I thought of the guy that made a you tube video alone in the Les Vegas airport lip syncing to Celine Dion “All By Myself” and this makes me laugh everytime I watch the video. Haneda Airport was peaceful and a few people on the same flight had hung back as well. We circled around the different levels in search of a place to set up, seats were far and few between and any that we came across had people fast asleep and stretched out in the most uncomfortable positions. Derek and I consider ourselves somewhat creative, and we erected our makeshift sleeping place in a matter of minutes on two long benches in the Edo Ko-Ji 4F level. We placed the two wheelie suitcases as a barrier in front of where our heads would be. Pulled the handles up and draped our travel blanket over to create half of a tent over our heads that would simply never last outdoors. I fell in and out of sleep on the bench, sensitive to the unfamiliar noises and the annoying travelators voice of a female with a high pitched voice. Just after 6:00am noise started to stir as flights began departing and arriving. Another couple had set up during the night opposite us. We washed at the cleanest airport facilities I have been too and moved our tired and sore selves. To reach Tokyo city centre we took the monorail train to Hamamatsucho Station and then the JR Yamanote line train to Tokyo station. The monorail station is conveniently connected to the airport, we found the doors to the platform opposite the Lawson convenience store.The monorail is fitted out specially for passengers carrying luggage and it is comfortable. Unlike the subway, the Monorail travels above ground and its a good introduction to Tokyo, tracing the river bank and moving between the buildings. Seeing the first glimpses of this incredibly built up city was a little exciting. With a population of 39 million the city is organised and tidy. As I later discover, Tokyo is the most organised city I have visited. It felt like Perth has more cars on the road with a population of roughly 1.9 million people. 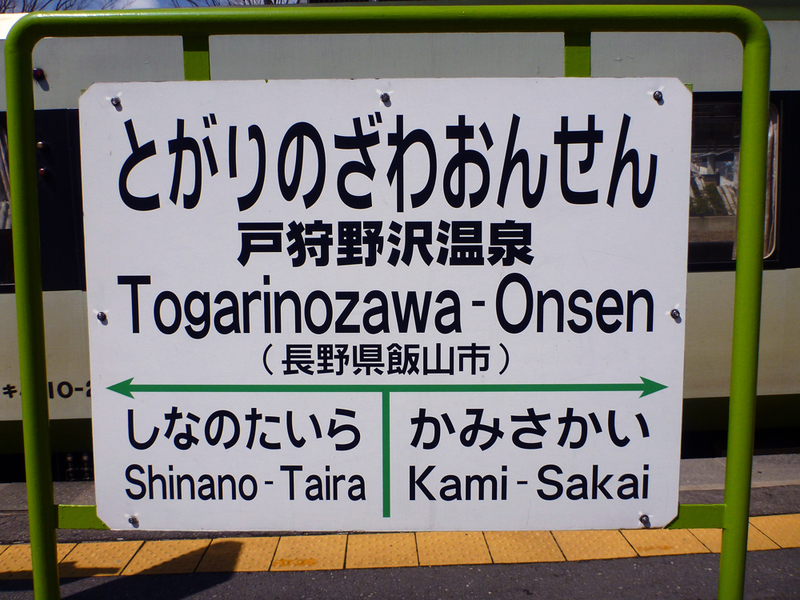 Arriving at one of the biggest train stations in Japan, Tokyo Station, we dropped our luggage off at a coin locker in the Granstar basement and boarded another train bound for Ogawamachi Station. 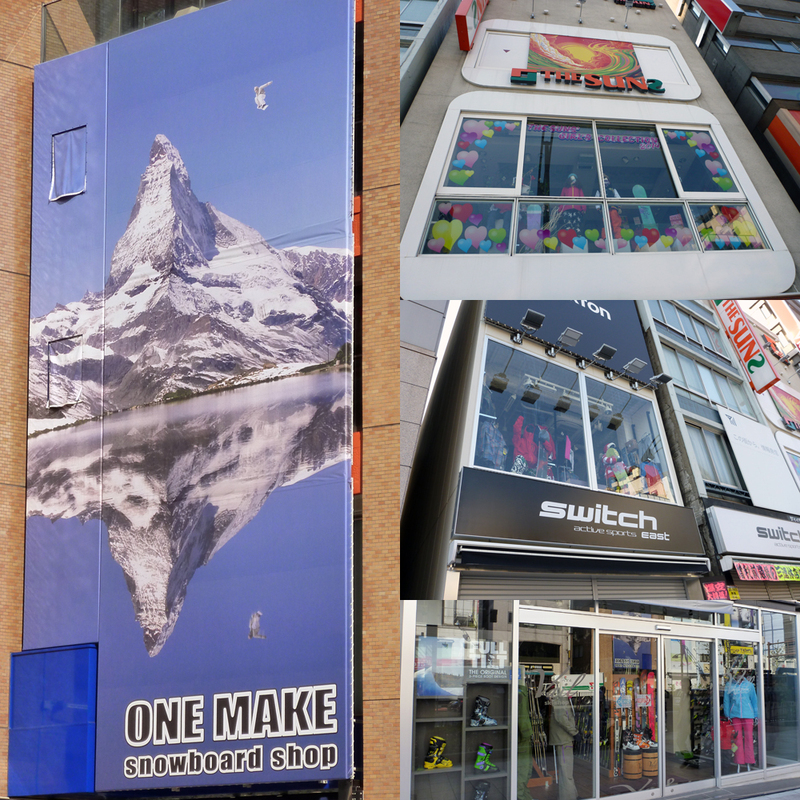 There are a bunch of ski and snowboard stores between the stations Ogawamachi and Jimbocho along Yasukuni-dori. 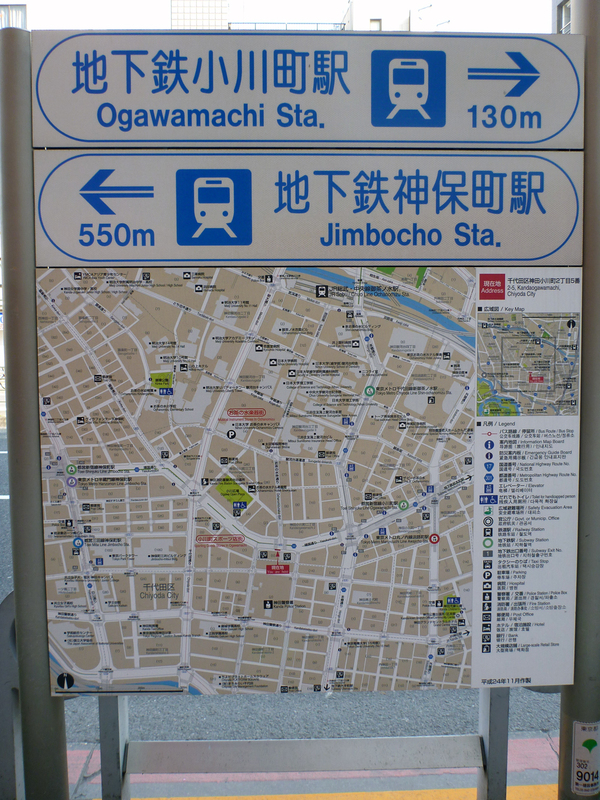 Even more along Hakusan Dori, starting from Jimbocho station. We were hoping to buy a few items for the ski trip at Nozawa Onsen. Our first 24 hours in Tokyo we were certainly discovering the quiet side of the city that I originally thought did not stop. The stores in the area were closed, opening at 11:00am. 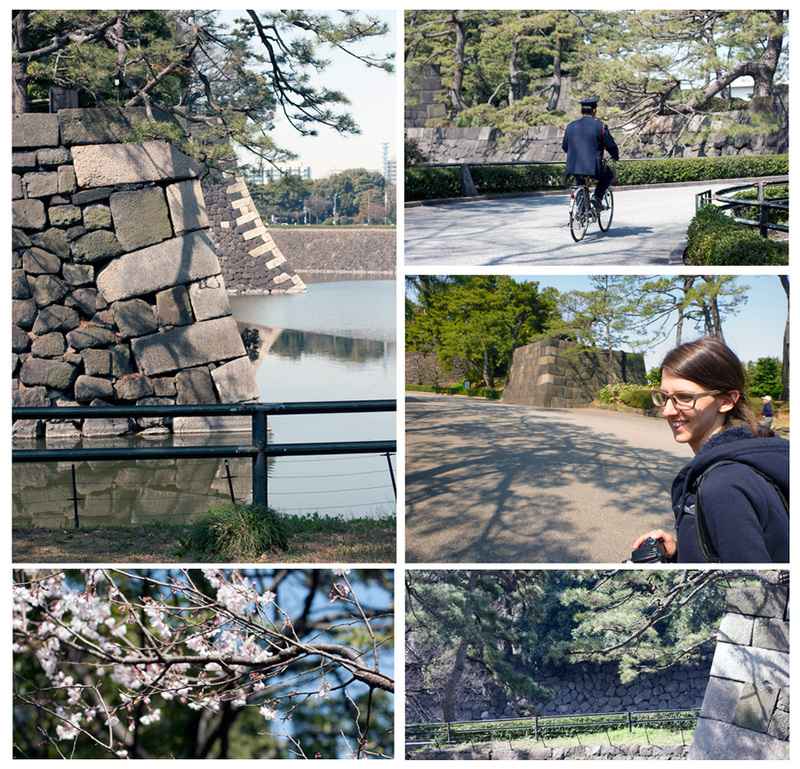 We killed time over a few espresso cups and ventured around the nearby Imperial Palace and East Gardens, seeing our first cherry blossom, a plum blossom and a blimp in the air. We were both a little grumpy and it was nice to be outside in the sunshine. Speaking as a beginner skier I thought the shopping was great and the prices were much more competitive than Australia. There would be at least 40 stores in the area targeted towards sporting enthusiasts. I bought some tinted goggles, knee-high socks, thermals and a couple of beanies. It was difficult to find ski pants, most of the stores in the area stocked snowboarding merchandise. If you are a snowboarder you’ll find a lot of neat stuff in the area. After our long morning, we returned to Tokyo station purchasing bullet train tickets from the JR ticket counter. We were stalled with a problem though, we could not find the coin lockers. When we dropped off the luggage earlier in the morning most of the stores were closed and now they were open. Different in appearance, we had clearly lost our bearings and as well, we kept losing each other in the crowds as we desperately tried to find the lockers, people were everywhere and it was hectic! We both saw RED running on little sleep. I felt like we were on the amazing race. What we had forgotten was that Gransta, where the coin lockers were, was located within the ticket gates of the station. A shopping mall within the ticket gates!! I felt really insignificant inside the Tokyo Station, it was a dizzying network of shops, cafés and restaurants. There are over 26 platforms and something like 3,000 trains a day. Shopping arcades and hotels are attached. Boarding the Shinkansen Asama bound for Nagano station we slumped into our seats releasing a deep sigh of relief. 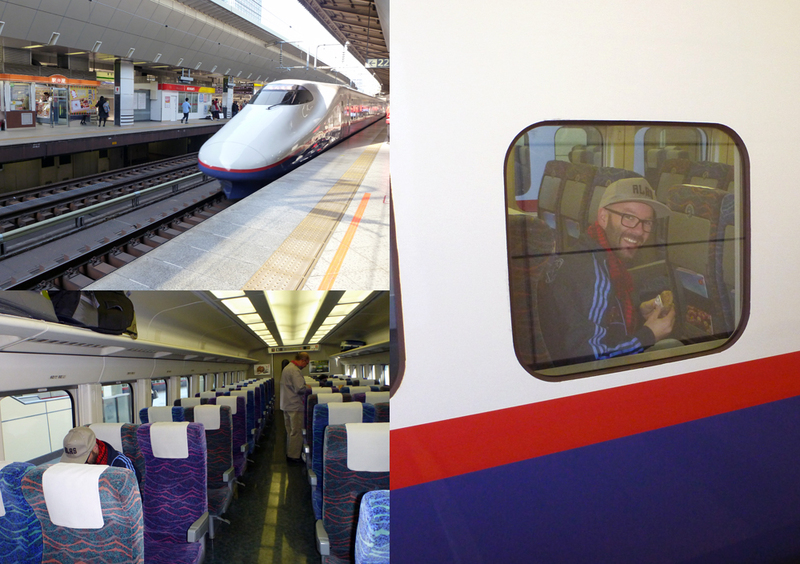 Then we got all excited, we were on our first bullet train journey!!! The Nagano Shinkansen first came into service a year before the the 1998 Nagano Winter Olympics. It travels a fast 260km per hour. 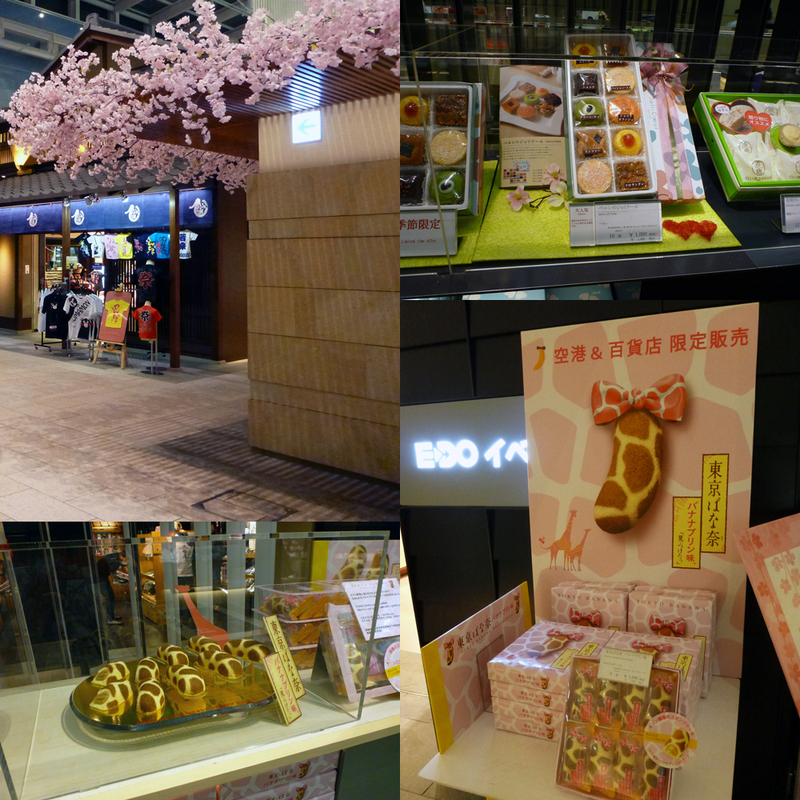 A highlight for the foodie traveller, is to purchase a Ekiben at the Shinkansen train stations. 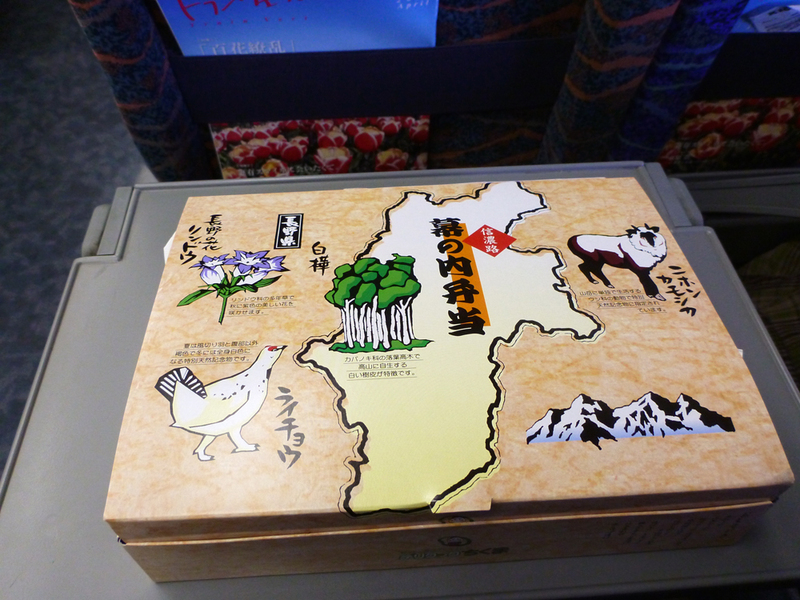 They are cute little bento boxes containing little portions of the regional food. 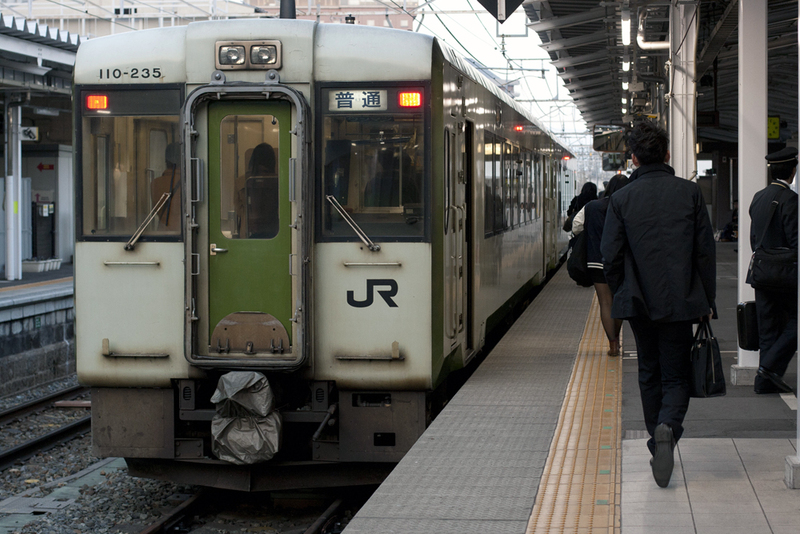 The “eki” in ekiben means station and “ben” is short for bento. The great thing is you can consume the Ekiben on the train. 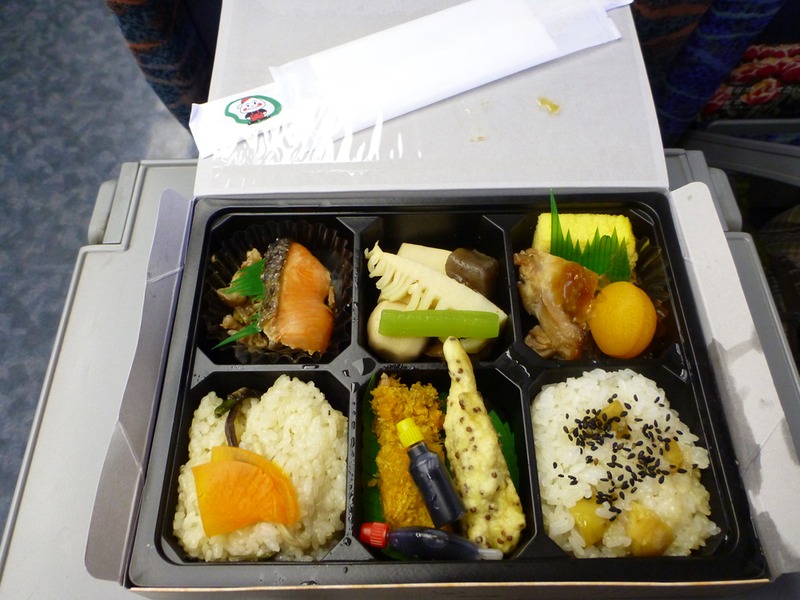 I was impressed at the quality of the food and wished I was travelling on more bullet trains just to purchase the Ekiben box! 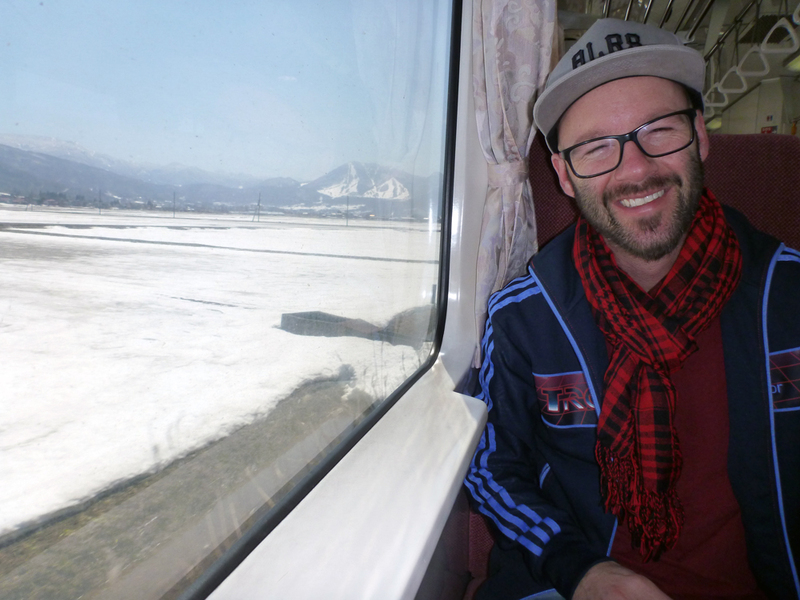 The 90 minute ride whisked us away from the metropolis that is Tokyo through smaller towns, rice fields and closer to the beautiful snow-covered mountain peaks. 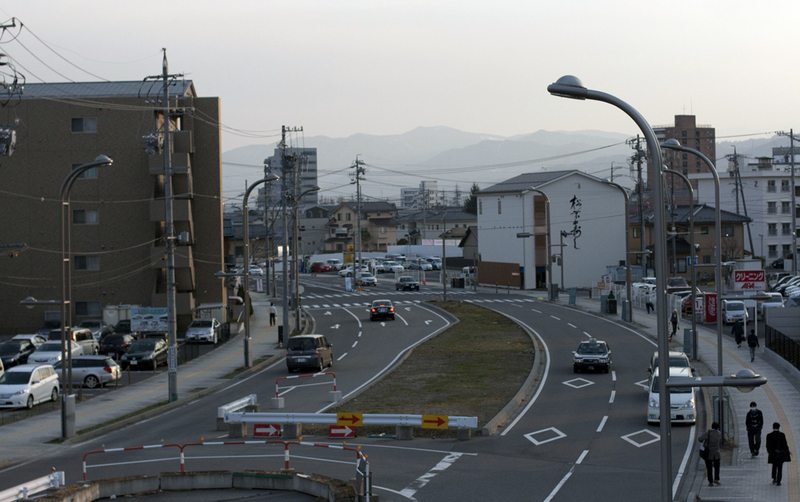 It felt so good to arrive at the former Winter Olympics town of Nagano, it was cold but we could see the outline of the mountains from the station and this meant our ski holiday was only a short distance away. Before the departure of the next train we grabbed some snacks from a regional store. Nagano produces wasabi, peaches, dates and sake. The 130 yen rice balls from the convenience stores were absolutely delicious, we ate them at almost all of the train stations we visited. 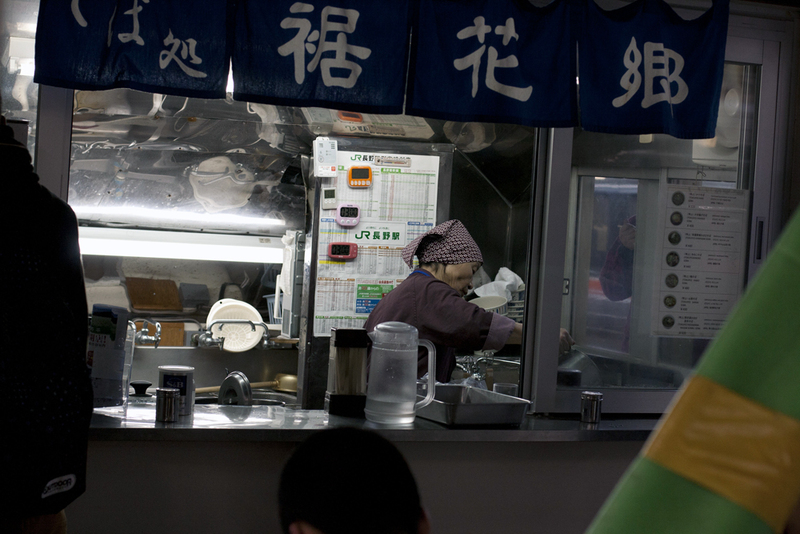 On the platform to Nozawa there was a little old lady making hot ramen. From Nagano we took the local JR iiyama Line to Nozawa Onsen. You can catch a bus from Nagano to the village of Nozawa Onsen but the train journey is far more picturesque. Arriving at the tiny one platform station we caught a taxi to our accommodation for 2,900 yen. 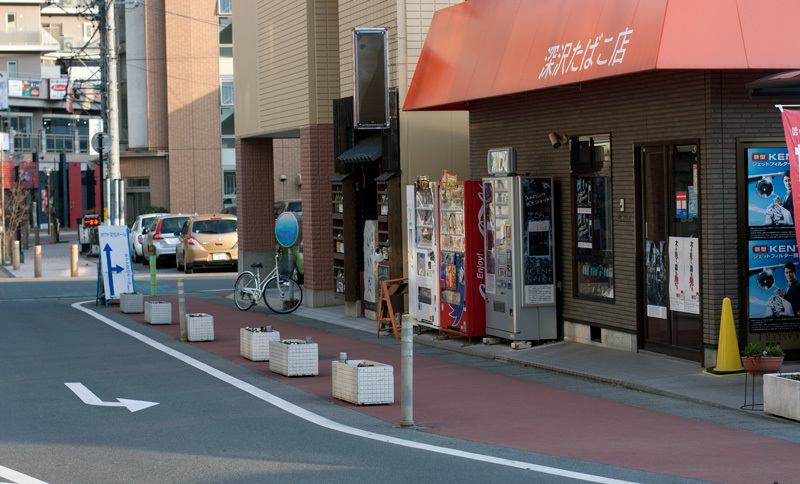 Just like a leg of the amazing race, our first 24 hours in Japan was a journey of excitement, frustration, experiencing new for the first time and complete unfamiliarity. 1 plane trip, 6 train rides and one taxi trip, we made it to the traditional mountain side town of Nozawa Onsen for 6 blissful days of skiing. 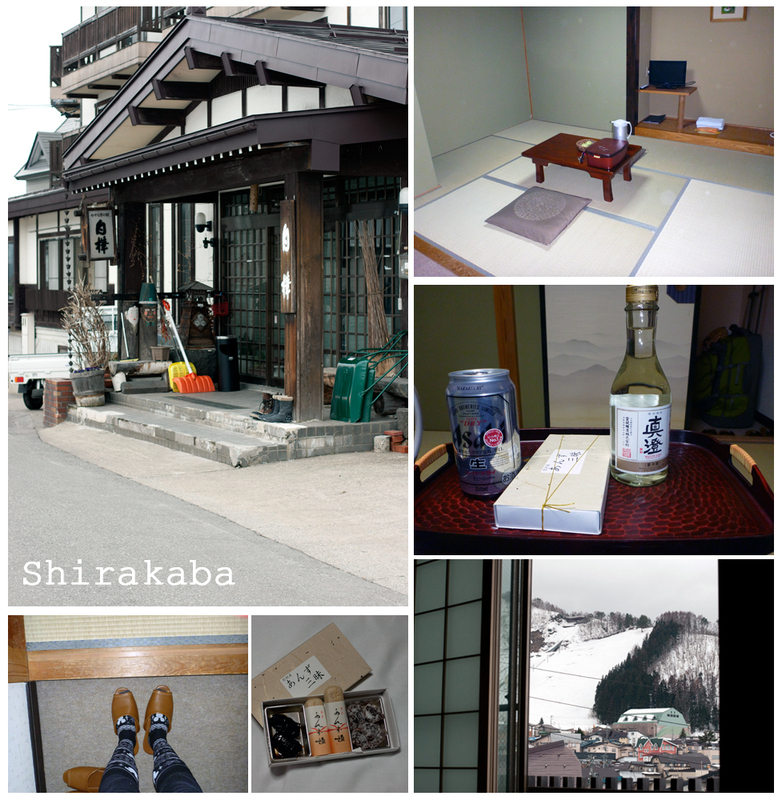 We unpacked and drank some freshly brewed matcha tea on the floor of our room at the Shirabaka Guest house. Then we opened the Sake and that is where this travel story ends! 1. 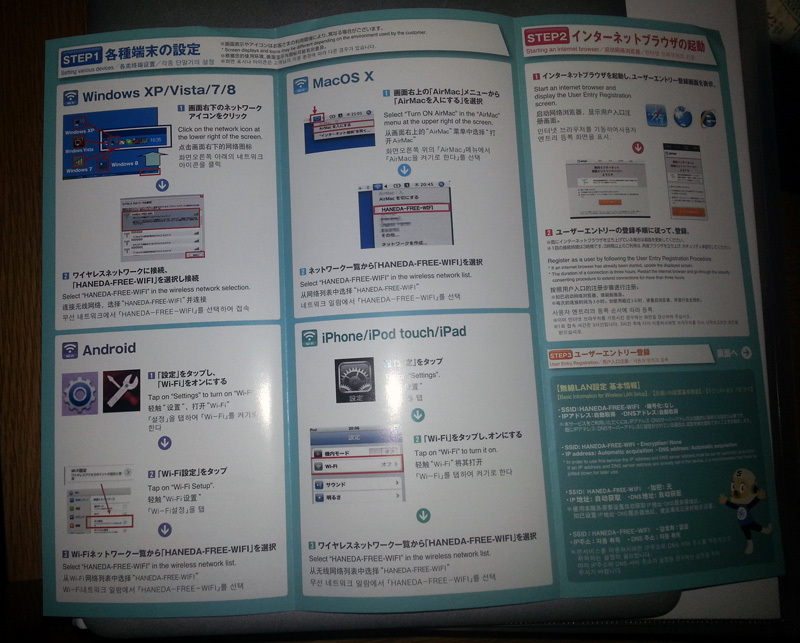 Choose the network ID(ESS-ID) “HANEDA-FREE-WIFI” on your PC or internet device. No WEP key is needed. 2. Open your web browser. 3. Procedures for the connection are indicated on the web browser. You must register your name and e-mail address. 4. Enjoy free wireless broadband! 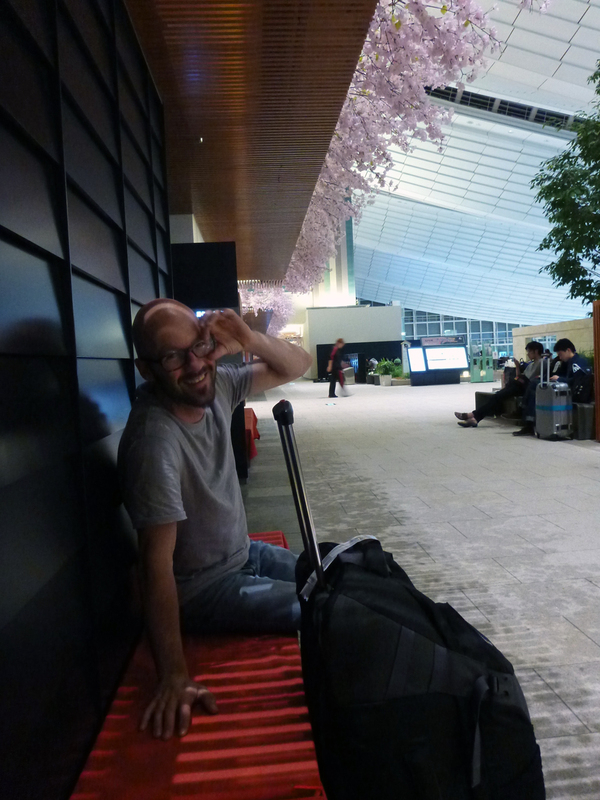 We flew from Kuala Lumpur to Tokyo with the budget carrier, Air Asia. The tickets were purchased on one of those red hot deal periods costing less than $500.00 per person return. Air Asia now take off from a new airport connected to KLIA, apparently much better than LCCT airport. The Tokyo monorail goes to Hamamatsucho Station in 20 minutes. A hotel connected to the Haneda Airport Terminal 2. Male and female capsules available. Short periods available. Accommodation very close to the airport, under 3km away. My first trip to Tokyo I took the Limo bus to The Park Hotel. It was comfortable and the driver speaks a little English. Bookmark Hyperdia, it is a great resources for checking up train times, connections and fares.